« The 10 Arsenal players who the media think should be sold now. On the Substitutes bench were Pauline Peyraud-Magnin, Jessica Samuelsson, Vivianne Miedema and 17 year old Ava Kuyken (whose Mum was sitting next to me). West Ham had Spencer (GK), Longhurst, Flaherty, Hendrix, Rafferty, Reichardt, Simic, Visalli, Kiernan, Ross and Lehman with Moorhouse (GK), Percival, De Graaf and Sampson on their bench. 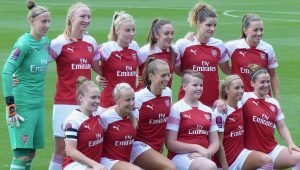 Both West Ham goalkeepers are ex Gunners, as are Gilly Flaherty and Vyan Sampson so a few familiar faces as they play their first game following their introduction to the top tier of Women’s football. Arsenal kicked off and looked comfortable without dominating the opening exchanges. The first chance of the game came in the 7th minute when our striker Beth Mead intercepted a poor Hammers pass inside their half and raced through on goal looking certain to score till a fantastic recovery tackle just as she was about to shoot saw the ball go out for a corner which came to nothing. A couple of minutes West Ham had their first shot on goal following an underhit back pass from Bloodworth but it was an easy save for Sari. In Min 20 it was so nearly two for us, another great through ball was collected by Nobbs but her shot was straight at Spencer, a little more composure needed had the ball been to either side it would surely have been two nil. Min 24 saw West Ham rightly awarded a free kick in a dangerous position. Fortunately Jane Ross hit it straight into our wall (which could have been tighter). The pattern of Arsenal being happy to play the ball around our final third then looking for a quick counter-attack continued and only desperate defending in min 28 prevented a second goal. Min 35 saw another near miss with Katie McCabe nearly added a second but her shot was just wide. Our second goal came virtually at half time and was a thing of beauty. A quick break down the left by Emma Mitchell resulted in the most delightful of crosses and Beth Mead leapt gloriously and finished with a thumping header which gave Spencer absolutely no chance. Worth the price of entry for that move alone! So a first half when we looked to be completely in control and I said to Ava’s Mum that I thought my pre-match score prediction of 4 – 1 was probably wrong in that I couldn’t see the 1 coming true. Her pre-match prediction was 3 – 1. 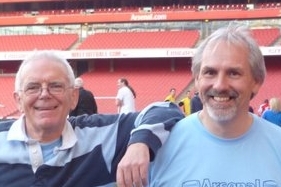 We both agreed that it only needed a moment’s lapse in concentration though for West Ham to score. At the start of the second half West Ham were more fired up than Arsenal and three minutes after the re-start they had their goal, two quick fire shots were blocked but we failed to clear our lines effectively and the ball came to Visalli on the edge of the area and her shot found the net through a group of players. They obviously had a different game plan during this phase of the game as they were targeting Emma Mitchell our left back and getting a lot of success. We made a substitution in Min 60 bringing on Miedema for Mead and she added a degree of extra assurance to our play as we weathered the West Ham pressure. I must say that during this phase of play the referee seemed to have swallowed a ‘Mike Dean’ pill as some of his decisions became increasingly erratic. His positioning was poor, rarely up with play and he missed a number of clear fouls by West Ham which should have resulted in cautions. Miedema had two or three half chances when she wasn’t pulled back by defenders, one resulted in a good but regulation save from a narrow angle, whilst a second shot was narrowly wide. Our third goal came in the 82nd minute and was McCabe’s second a thumping shot from distance low down to the right corner of the net. Lisa Evans looked to get in on the scoring with a thunderous effort which beat everyone but came back off the post. Min 86 saw our second substitution with Jessica Samuelsson getting a brief run out as she continues her recovery from the foot injury which saw her sidelined for virtually the whole of last season. Lisa Evans had another go just before full time but again to no avail as Ava Kuyken waited to come on. The fourth Official indicated 4 minutes of time to be added on and the ball stayed in play, and stayed in play till eventually with about 30 seconds on the clock Ava could come on replacing the excellent Lia Walti (she is a really good player and would probably have been my player of the match – but not for the official supporters club who chose Jordan Nobbs). In her 30 seconds on Ava didn’t have a touch but her Mum was still pleased to see her getting some pitch time rather than sitting on the bench for the whole time. It must be hard for her trying to get on ahead of probably the strongest midfield in the country. As Emma Mitchell said in a recent interview, “I wouldn’t want to be fighting for a midfield place at the moment”. I’m sure that Ava’s time will come, probably when we play one of the lesser teams in this competition. From gloomy cloud at kickoff to bright sunshine at the final whistle a good game of football and a deserved win to the Arsenal. Well Done! A good start to our competitive season.